BeColourful ENCHANTING STARS...See How It Grows! Authorized Instructor for Jacqueline de Jonge & BeColourful!! I'M WORKING ON JUDY NIEMEYER'S BALI BED RUNNER...WHAT ARE YOU DOING THIS WEEK??? 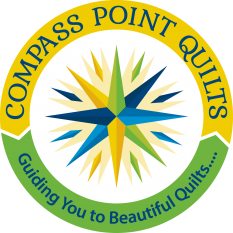 What will you find at Compass Point Quilts Studio?? A WEEKEND AT "A QUILTERS' SAMPLER"
CPQ Studio Up & Running - WooHoo!! Glacier Star takes BEST IN SHOW!! Busy Weekend @ CPQ Studio!! Cactus Flower Class @ Mariner's Compass Quilt Shop in Bath, Maine!! CPQ Renovatio...Check Out What Is Happening at CPQ!! CPQ Studio is a GO! !